QMS Lite™ is a hosted website that serves as an easy to view an online shipping rate calculator based on your own company logo and color schemes. As opposed to the enterprise system of Catapult QMS®, the Lite version doesn"t have the intricate search methods and buttons but rather a clean feel that is attractive to customers, agents, and sales representatives. Compared to a Travelocity® or Expedia®, QMS Lite™ allows the user to enter origin, destination, mode and rates are returned in seconds. From a box to a container, your site will be able to retrieve ocean and air shipping rates in seconds based on your own carrier agreements. 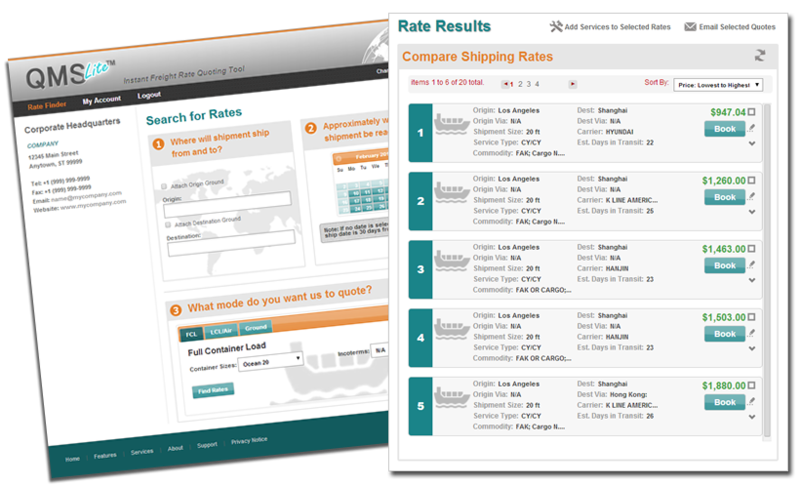 Your sales departments, branch offices, and customers want a friendly, easy to use website that is simple for them to view their own international shipping rates. Our agents love QMS Lite because of the ease of retrieving our international shipping rates. It&apos;s like a travel booking site. QMS Lite has grown our business significantly by offering an instant online rating tool for our customers.